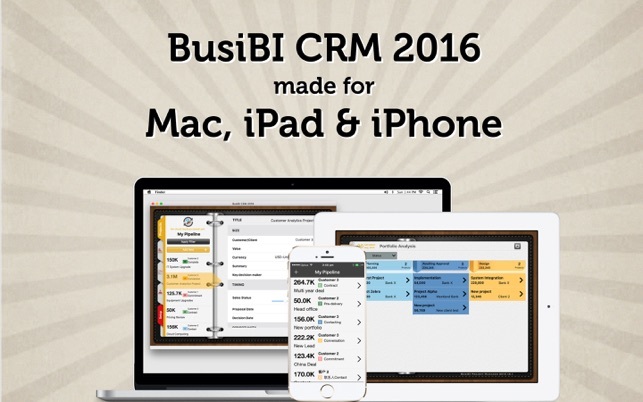 Amazing, full featured CRM, built for Mac, iPad and iPhone from busibi.com. As featured in Lawyers Weekly, Girl's Guide to Project Management, The Sweet Setup and WINK. Configurable opportunity tracking, contact management, task reminders, pricing schedules and social networks integration. 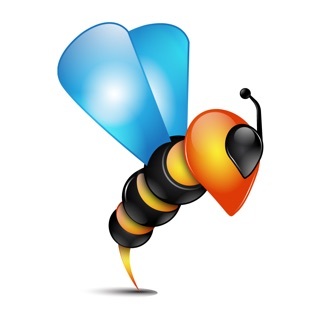 This app requires MacOS v10.9 (Mavericks) or greater. 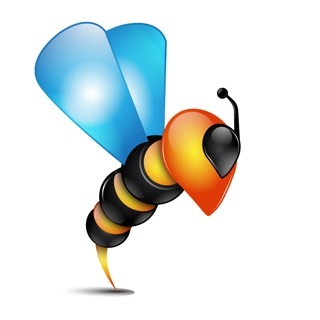 Mavericks was released on October 22, 2013 as a free update by Apple. 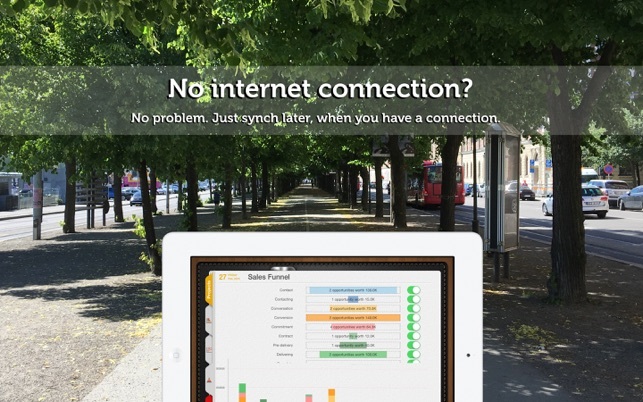 MOBILE FIRST - No internet access required, just synch when you have a connection. 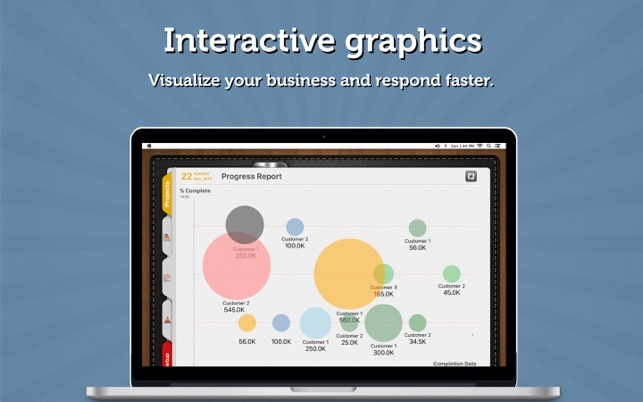 Drag and drop bubble charts to keep your pipeline data up to date. 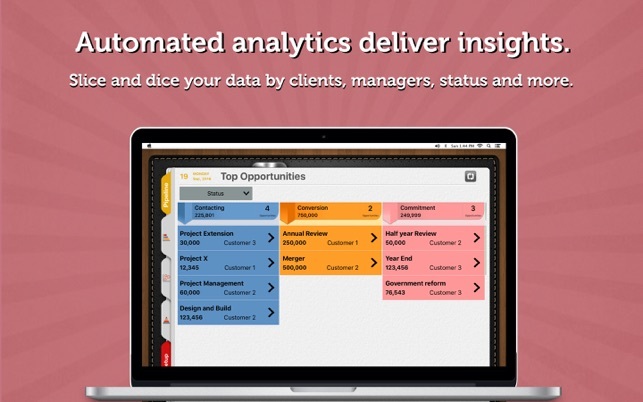 Track your pipeline, contacts, actions, meetings. No internet connection required, works offline. Simple to use, powerful and configurable. Fully integrated with your Address Book contacts, calendar and tasks. Sync your address book with Facebook and LinkedIn. 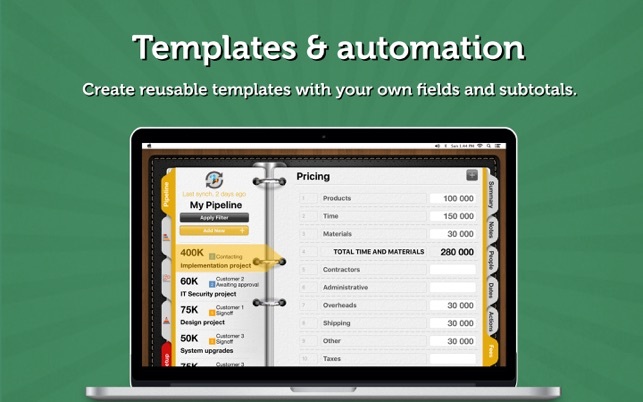 Add your own custom fields and configure pick lists to suit. I’m frequently surprised by superb software developers who create beautiful user friendly software, but because of little real world experience the software is unusable. Such is the case with Busibi CRM, and likely the various Busibi variations. Busibi has the potential to be a spectacular app, but due to several problems and two nearly fatal flaws, it is not useable. Near Fatal Flaw #1: The CRM has a very nice looking, simple section for “Actions” (their name for tasks). If you’re only working with one client at a time this is just fine. However, I typically have 50 clients in my pipeline, with tasks to be performed on about half of them. The problem is that there is no view where I can look at all my tasks. This means I need to look at all 50 clients to see the tasks I have in front of me. Further, I must then write down the ones which I need to reference. All that keeps this problem from being a fatal flaw is that there is nice integration with “Reminders”. This provides the ability to create views inside the Reminders app. Obviously it is very cumbersome to switch back and forth between two apps. Near Fatal Flaw #2: The app is integrated with “Contacts”, but in all the wrong places. Every time you create a new client, you are presented with a nice looking, simple “Summary” where you can list the high-level information of every client. You start by manually entering the client name. Not a big deal, except you need to go back to contacts to copy and paste the name to be sure it ties in. Inside the Summary is another place to list the client name. This may or may not be redundant, but again you must manually enter the name. But further down the page is four different lines for team members. In each of these lines you enter names only through integration with Contacts. The problem is that after six years in my present positon I have about 2,000 past, current or prospective clients, vs. only five team members. Further, I don’t remember the exact spelling of the names of each of the 2,000 clients and need the integration with Contacts; while I obviously know the names of my five team members, making the look-up an inconvenience. •	Looking up names in Contacts is extremely slow. I have a year old iMac with a flash drive, yet it takes about 30 seconds to lookup a name through the integration feature. Perhaps it’s because my Contacts data base is too large with about 8,000 contacts. •	Each client has a separate section for “People”. It is integrated with contacts, but not anything else. Other than having a quick reference of who is involved with the client, it doesn’t serve a purpose. •	Small Size – Apparently Busibi was made for the iPad Air and the developer used the same size for Macs as well. This means that I need to scroll through several screen views to see all my data, whereas it would be little or no scrolling if all the space on my large iMac monitor was utilized. •	Documents can be attached only through Dropbox. Since I use Dropbox that is okay, but I don’t put all my docs into Dropbox. Also, the lookup is clumsy, and since the file name is truncated, I can’t always identify the file I want. Bottom line, if you have 1 or 2 clients this is an outstanding app. However, as the number of clients grows, the app’s usefulness declines to the point where it is unusable.